After its debut at this year’s Manchester Festival, Damon Albarn’s reimagining of Lewis Carroll’s Alice’s Adventures in Wonderland now transfers to London’s National Theatre, where it’s playing in the Olivier Theatre. Following press night on December 10, Troy Nankervis finds the best reviews from across the theatre world. 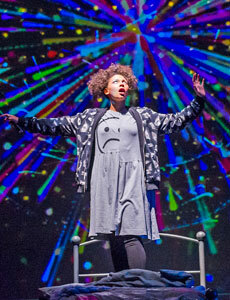 Blending digital technology with live performance, the production reimagines Alice as Aly (Lois Chimimba), an unsettled teenager who flees her dysfunctional family and schoolyard bullies to the cyber world, where her newly-created avatar Alice (Carly Bawden) meets a host of quirky and bizarre characters. Wonder.land also stars Simon Anthony, Sam Archer, Leon Cooke, Nadine Cox, van De Freitas and Hal Fowler. At the helm of the creative team is director Rufus Norris, music by Blur’s Damon Albarn, with book and lyrics by Moira Buffini. Wonder.land plays at the National Theatre until April 30, 2016. Writing in the Telegraph , Clare Allfree’s four-star review praises the “visual flair” of director Richard Norris and the design team. Costumes by Katrina Lindsay “cleverly combine real people with shades of their Wonderland counterpart”. “Rae Smith’s set deploys shape-shifting, almost hallucinogenic abstract visuals that beautifully evoke something of the infinite realms of digital reality,” she said. “It often all feels a bit trippy – there’s a particularly brilliant psychedelic caterpillar made out of a chain of human “baubles”. Published in The Upcoming , Yassine Senghor’s five-star review calls the musical an “ambitious and extraordinary re-imagining of the Alice in Wonderland story”. For Senghor, the cast stands out for “amazing vocals, which convey realms of emotion within their warbles and quavers… Lois Chimimba carries the show as Aly, who is bold and rambunctious as she stands up to her bullies with sharp humour,” she writes. In his two-star review published in The Stage , Mark Shenton gave the “muddle of a musical” the “benefit of some doubts” during its Manchester Festival debut , but said the NT transfer is “similarly dressed up with nowhere to go”. 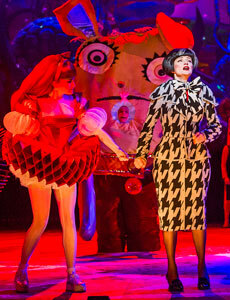 While Shenton applauds the “ambitious” production, he equally blames the special effects and “indifferent tunes” for putting Wonder.land in serious “danger of being upstaged by its own visuals”. He adds the “oddest of all” decisions to stage the show in Olivier would have sat “far more comfortably in the Lyttelton”. Quentin Letts from the Daily Mail disagrees with Senghor’s praise for the cast in his two-star review , saying the ensemble “struggle with an underwritten script and over-use of computer graphics”. “The whole thing is pervaded by a puerile coarseness,” he said. 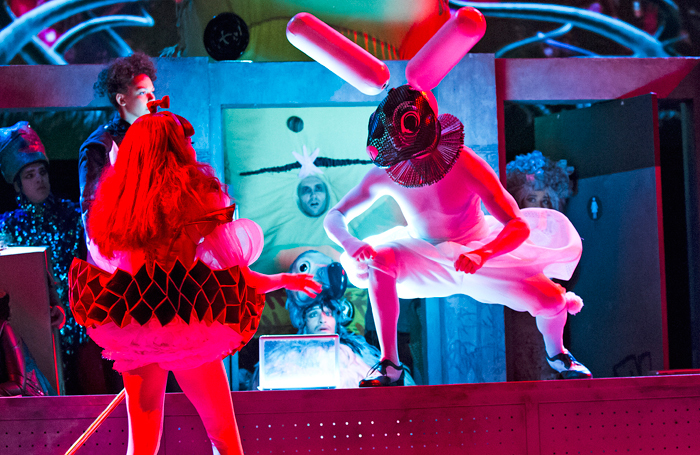 While calling the production “certainly different”, Letts said it feels “patronising”, with its high-end production design completely let down by the lack of “narrative foundations”. Despite “dazzle and visual inventiveness” Henry Hitchings writes that Wonder.land is a “deranged” musical that feels “cluttered, confused and overstuffed” in his two-star review published in the London Evening Standard. “Moira Buffini’s script is predictable, preaching the need for self-acceptance, but Albarn’s music is a bigger problem,” he said. Calling Wonder.land a “parable about the status and ethics of our virtual lives”, Matt Trueman agrees the production is “something of a muddle” in Variety , yet is a “watchable” one thanks to its “spectacular” staging, design and direction. Like Hitchings, Trueman cites Albarn’s musical score as the production’s biggest problem. “The Wonder.land score refuses us any simple satisfactions, aiming, instead, for something sung-through and Sondheim-esque,” he said. Writing from The Art Desk is Aleks Sierz, whose three-star review said the production gives a promising start that’s “not the usual crinoline-heavy fey adaptation of the original”. But like other critics, Sierz said its major problems start with Albarn’s music, and “at their best”, “Buffini’s lyrics are entertaining, emotionally direct and occasionally funny”.